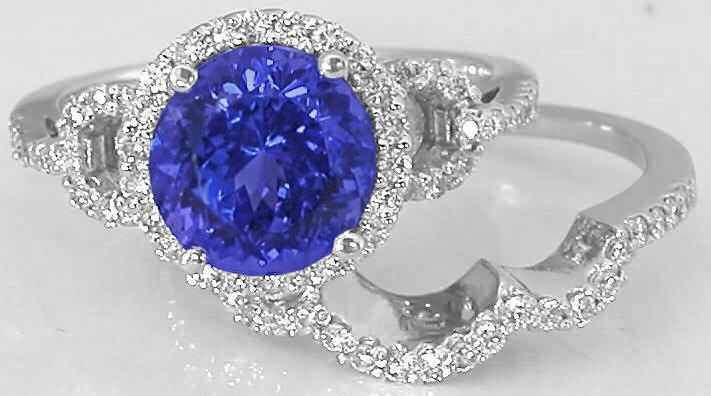 Could we come up with 15 trillion ideas on ways to use a Tanzanite gemstone? Perhaps, but it would take awhile and we would rather you were out wearing the gemstone than sitting by your computer reading about it. 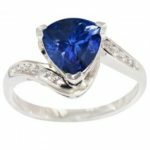 So, let’s give insight on 15 “trillion” style Tanzanite rings. 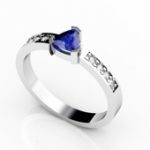 For example, look at the setting of this 1.25ct Trillion Tanzanite Solitaire Ring in 14k White Gold. It is internally flawless as it glows in its bluish-violet presence. (2) Trillion Style is perfect if you seek shape & design which deviates from basic round gem settings. 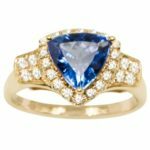 This .90ct Trillion Shape Tanzanite Ring With .02ctw Diamonds in 14k Yellow Gold presents a gorgeous trillion tanzanite of 0.800 carats clawed from all the 3 sides with gold; it looks even more stunning when studded with 4 round diamonds of 0.020 carats at one edge of the gemstone. (3) What you see is what you get as a trillion cut stone will usually look larger. Consider this .66ct Trillion Tanzanite Ring With .17ctw Diamonds in 14k Yellow Gold. A beautiful, charming ring made of trillion tanzanite of 0.600 carat enclosed with 33 diamonds of 0.170 carats. (4) This blue variety of zoisite was named by Tiffany & Co. For Tanzania, the country where it was found. 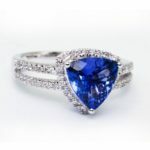 This .66ct Trillion Tanzanite Ring With .17ctw Diamonds 14k White Gold is a classic ring, giving a timeless feel, encrusted with 33 round diamonds. 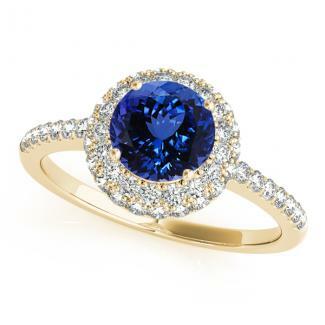 (5) Tanzanite rings can be easily paired up with formal as well as informal attire due to their elegant appearance. An extremely elegant ring, especially for those who prefer a simple and sophisticated look would be this .35ct Trillion Tanzanite Ring With .06ctw Diamonds in 14k White Gold. 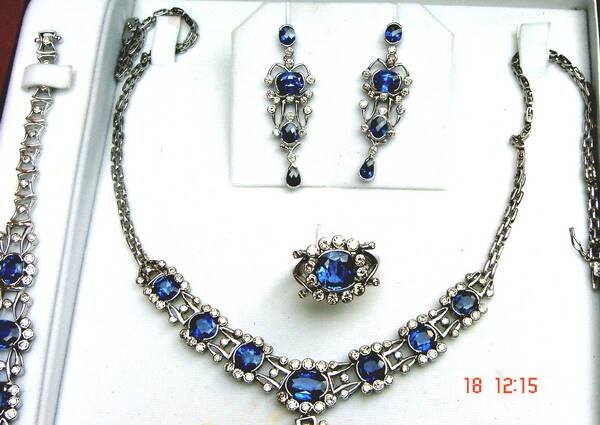 (6) The Tanzanite stone colors range from a very dark and intense blue to a very pale, almost baby blue color. The twisted band on this 1.5ct Trillion Tanzanite Ring With .11ctw Diamonds in 14k White Gold. Makes it look trendy and stunning. 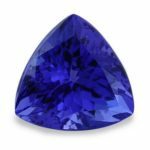 (7) Tanzanite is mined in only one place in the entire world, a 20 square mile area in Northern Tanzania, that makes it quite rare. Take a moment to look at this 1.5ct Trillion shape Tanzanite Ring With .07ctw Diamonds in 14k Yellow Gold. The blue aura of tanzanite when blended with subtle shine of gold makes it look extremely divine and artistic. (8) Henry Platt, former president of Tiffany & Co., described tanzanite’s discovery in 1967 as THE most important gemstone find in 2000 years! Most of the rings pictured and commented upon are for the ladies, but this is most suitable for the men’s. 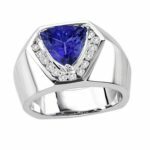 2.25ct Trillion Tanzanite Men’s Ring With .7ctw Diamonds in 14K White Gold. There are 42 diamonds. 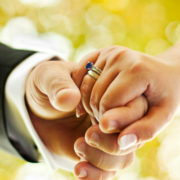 This ring can be paired up easily with any formal as well informal attire. 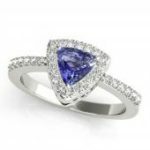 You don’t have to count them but this 1.75ct Trillion Shape Tanzanite Ring With .27ctw Diamonds in 14k White Gold has 59 diamonds. 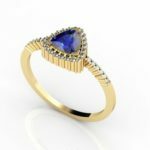 What can you say about this .35ct Trillion Tanzanite Ring With .06ctw Diamonds in 14k Yellow Gold? A plain ring, it consists of a trillion tanzanite of 0.350 carat and looks amazing with graceful formal attire. The cuts and corners of this 1ct Trillion Tanzanite Ring With .31ctw Diamonds in 14k Yellow Gold. are so well finished that it seems extremely flawless when adorned on the delicate finger of a stay at home mom or a corporate CEO. Just look at the blue/violet coloring, the 30 diamonds, and you can tell that this .35ct Trillion Tanzanite Ring With .24ctw Diamonds in 14k White Gold would goes well with formal as well as informal attire. 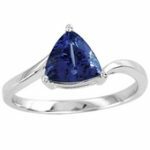 (13) Tanzanite has a hardness of 6.0-7.0 on the Mohs Hardness Scale. 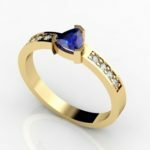 Without a doubt this .35ct Trillion Tanzanite Ring With .24ctw Diamonds in 14k Yellow Gold will fit in easily with any occasion and any attire. 30 diamonds set into the ring add to that allure. 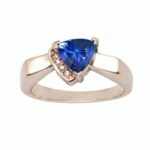 (14) The safest way to clean tanzanite jewelry is to use warm, sudsy water and a tightly woven microfiber or other soft cloth. Looking at this .35ct Trillion Tanzanite Ring With .24ctw Diamonds in 14k Rose Gold? This ring is a must have accessory for every female’s wardrobe as it can fit in well with every occasion. (15) Tilt tanzanite and you’ll see three distinct colors in three crystal directions. 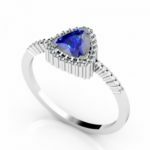 This stylish 2 ct Trillion Tanzanite Ring With .11ctw Diamonds in 925 Sterling Silver could be the right choice for those who like to remain in vogue. The twisted band made of 925 Sterling Silver studded with a trillion tanzanite of almost 2 carat looks stunning. 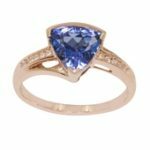 Toptanzanite.com has a diverse selection of gemstones and rings to accommodate you.. Pleased explore our on-line catalog.